St. Kitts and Nevis Prime Minister Honourable Dr. Denzil Douglas said the recent success of the national team at the IAAF 2011 World Championships in Athletics held in Daegu, Korea is a direct result of upgrades in the sporting infrastructure and enhanced partnerships with sporting organizations. â€œI believe that the investment that we have made over the years is in fact paying off,â€ he stressed at a welcome ceremony for three members of the Menâ€™s relay team that captured bronze at the 4×100 meter finals. The Prime Minister congratulated sprinters Delwayne Delaney, Antoine Adams and Jason Rogers who were present as well as their teammates sprint icon Kim Collins and Brijesh Lawrence who are slated to return at a later date. He noted how proud the Nation is of their accomplishments. Kim Collins was singled out for being the most successful local athlete in the international arena, a title he solidified by winning bronze in the 100 meters finals at the same event. The Prime Minister highlighted the contributions of the Deputy Prime Minister Honourable Sam Condor and credited him with much of the achievements being enjoyed across various sporting platforms considering he laid the foundation as the first and longest tenured minister of sports in the administration. Appreciation was also expressed to former sports ministers Richard Skerritt and Jacinth Henry-Martin as well as to the current Minister Honourable Glenn Phillip. Under their stewardship, infrastructural developments included the construction of the world class Silver Jubilee athletic stadium, refurbishment of the cricket and football stadiums at Warner Park and the upgrading of many sporting grounds around the island. Several development programmes have also been created or enhanced to expand the recruitment of young people into various sporting disciplines. 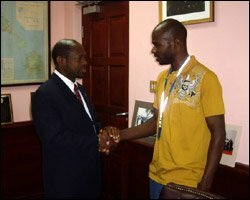 Prime Minister Douglas went on to cite the main partners in sports development, and track and field in particular. The Prime Minister thanked the families of the athletes for providing a strong support structure and pledged the continued support of his Government towards the continued growth of sport in the twin-island Federation.